obtain a Advanced Diploma qualification from Middlesex University and will be eligible for professional accreditation with the Irish Association for Counselling & Psychotherapy (IACP). To be ethically aware and to have learned a process of ethical decision – making in supervision. Entry Requirements Applicants are required to hold a Diploma or Degree (Level 7 or higher) in Counselling & Psychotherapy, Social Work, Sociology, Psychology, Education, Medicine or equivalent. Applicants who do not hold a Level 7 qualification may be considered on the basis of substantial relevant experience and training. Applications in this category will be considered on a case by case basis and applicants will be required to furnish documentary evidence of experience and training. Carear Path Graduates of the Advanced Diploma in Supervision will be qualified to practice as a professional supervisor, working with individual supervisees and in an organisational context. The programme also introduces the practice of group supervision. Career opportunities may include private practice, work with state and voluntary organisations, mental health organisations, social care providers, business and any environment whereby supervision is provided or required for practitioners. This programme can be effectively integrated with any qualification that students have already achieved. 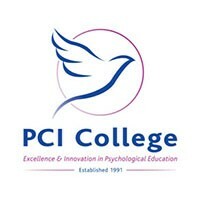 For information about PCI College, please visit our College Profile page on Postgrad.ie by clicking here.